‘The Walk’ isn’t the first time Philippe Petit’s daring, crazy wire walking stunt between the twin towers has been shown on film, with ‘Man On Wire’ winning the ‘Best Documentary Award’ at the Academy Awards in 2009, but it’s the first time it’s been turned into a drama. 14 years after 9/11, filmmakers are gradually becoming more comfortable returning to the twin towers, and ‘The Walk’ tells Petit’s story of the wire walk that made the towers famous worldwide before they’d even opened. 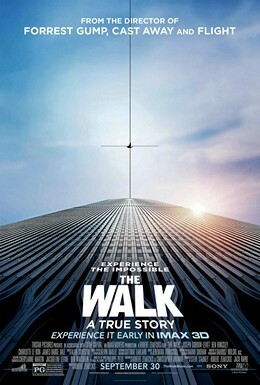 The film is directed by Robert Zemeckis, a man known for his use of visual effects, and he’s an ideal choice for giving ‘The Walk’ the light and breezy style that makes this a winning piece of entertainment. Like ‘Man On Wire’, ‘The Walk’ chooses to tell Petit’s story like a heist movie, and beyond some table setting at the beginning when we learn about his childhood and what made him choose wire walking as a ‘career’, the film is focused primarily on the main event itself. The film is anchored by Joseph Gordon-Levitt as Petit, and whilst his French accent could do with some work, he perfectly encapsulates the charisma and enthusiasm coursing through Petit’s veins. Zemeckis direction is incredibly stylish, with the use of montage and a bombastic score from Alan Silvestri to whizz through the events leading up to the walk. This introduces us to Petit’s inspiration (Ben Kingsley), his girlfriend (Charlotte Le Bon) and a collection of accomplices to help him get into the twin towers undetected to prepare for his attempt. The film has a lot of funny moments and it’s hard not to smile at Petit’s unbridled passion and enthusiasm, even whilst acknowledging how absurd his ambition is! All the set up and stylish moments would be for naught if Zemeckis and Gordon-Levitt couldn’t nail the crucial sequence, and thankfully they both do with aplomb. I saw the film in an IMAX 3D showing and Zemeckis really makes you feel like you’re on that wire with Petit (there have been reports of some people getting motion sickness from the effects! ), and despite the story being well known, he still manages to build suspense as Petit walks from side to side. Bolstered by excellent special effects and a charming, pacy narrative, ‘The Walk’ succeeds with style, and this is a really enjoyable movie.